Primitive Daisy Spring Summer Hand Painted Tissue Box Cover. 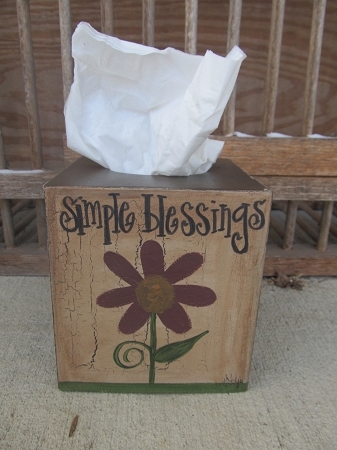 Primitive Hand Painted Daisy Tissue Box Cover. 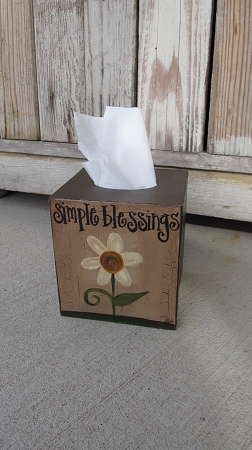 What a pretty way to disguise your common tissue boxes with primitive country flare! Other seasonal options available. For this one, I've hand painted a daisy on the front and antiqued it up a bit. You can choose the color for the sides and the saying is Simple Blessings. Shown here in chocolate brown. I got a request to have a darker flower painted, so I'm now offering to change the color of the flower. The paper mache cover is for boutique style tissue boxes, size is 5"x5"x5". Sealed with a matte sealer. Hand painted, designed and signed by Heidi.